Brian J. Robertson is an author, seasoned entrepreneur, former-CEO, and the founding father of Holacracy, an “operating system” for installing self-management into organizations. He now works with HolacracyOne, the organization he launched to support Holacracy. Brian previously founded and led a fast-growth software company. The firm won numerous awards both for fast business growth and innovative people practices, and it was there that Brian experimented with the management techniques that have since evolved and matured into the Holacracy method. In 2015, Thinkers50 added Brian to their Radar List, recognizing him as one of 30 thinkers most likely to shape the future of how organizations are managed and led. 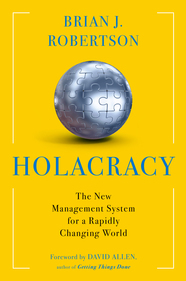 Holacracy has been adopted by over 300 companies around the world to date. Brian’s book, Holacracy: The New Management System for a Rapidly Changing World, was released in 2015. Robertson explores how to shape a company into an evolutionary organism—one that can sense and adapt and learn and integrate.